Photo: Peter Kowalczewski Barrancos's traditions, cultural diversity and architectural beauty make it one of the most popular areas of Lima. A winding promenade perched atop a cliff prevents the small district from falling into the Pacific. It rings the neighborhood's bohemian and stately areas, which are as inviting as they are elegant, despite soot-covered streets. Barranco's gardens are in bloom throughout the year, adding splashes of color to weather-worn balconies and ornate facades. A stroll at dusk offers changing views bathed in the pale pink of the sunset, while a stop in a Barranco bar offers refreshment - via drink and dance - for the soul. The 40,000 inhabitants of this district share an area of only three square kilometers. Its graceful old mansions, still the ochre, yellow, rose, sepia and lapis lazuli that were fashionable decades ago, blend as if their owners were party to some aesthetic agreement. These listed buildings are part of Peru's national heritage. Some have been turned into institutions such as the Juan Parra del Riego Cultural Center, the Scolla Cantorum Cultural Center and the Pedro de Osma Museum, which houses a fine collection of Spanish colonial paintings, sculpture and silver. Barranco is a fine blend of town and country. It lies at the hub of a semicircle formed by the districts of Miraflores, Surco and Chorrillos, which contributes to its multi-ethnic character. Its reputation as a bohemian hangout brings the youth of Lima and tourists in droves. Each weekend, they fill the pubs and restaurants that surround the plaza and municipal park, eating everything from pizza to papa a la huancaina, potatoes in a slightly spicy cheese sauce. On weekdays the place is returned to the locals, who go unhurriedly about their lives. The old tailor, the priest and the baker all tend their duties, while others sit on their favorite bench to read the paper. Near the plaza is a steep pedestrian road to the ocean, the Bajada de Baños. Houses with simple but spacious wooden verandahs line the Bajada, and an elegant restaurant shaded by ferns serves four-star fare. A river is said to have once flowed over the Bajada's cobblestones, down to the Pacific. Was none other than God. Legend has it that Barranco was built after a glowing image of Christ appeared. The Church of the Hermit was built on the spot of the alleged apparition, next to the Bridge of Sighs. Its cantaloupe-colored exterior stands in brilliant contrast to Barranco's blue summer sky. The trees and lampposts lend the place a magical air, where birds sing and nature enjoys a respite from the city. 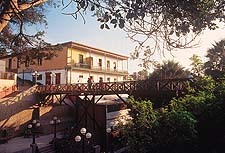 Barranco is known for the writers, painters and musicians who seek inspiration from its vistas. Many come to rest, living in houses lining the cliffs. Walking through San Francisco Plaza, along Saenz Peña Avenue or Junin and Ayacucho Streets, you will see why it is better to see Barranco on foot. Don´t miss the jacaranda tree and its insistent purple shadow. But do not disturb; no barranquino would dream of disturbing.